An RF Modulator is an electronic device for converting audio/video signals into RF (radio frequency) signal. RF modulators are used to connect DVD players, video game systems, camcorders and other video components to TV sets without Audio/Video inputs. The connection is made from the DVD (or other component) a/v outputs to the RF Modulator and from the RF Modulator to the TV's antenna input jack. Back of RF Modulator box. The DVD Player connects to the yellow, red, white RCA jacks and the silver coaxial cable connection goes to the TV antenna input. The antenna IN connection on the box can be the cable TV source directly or from a VCR. Connect up to four video components to any TV. Now you can hookup your DVD player and game console to one box and see and hear everything on your TV with no unplugging and plugging in again as on single input RF modulators. TERK’s RF Modulators allow video components such as DVD players, video game systems, VCRs and camcorders to be viewed on televisions that are not equipped with an available audio/video jack. TERK’s RF Modulators are the ideal way to connect multiple components to any television, making it easy for everyone in the family to enjoy their favorite movies, video games and other video sources anytime. Terk’s Mod-41 allows the viewer to connect up to four video components to any TV. Available online at electronics retailers for around $35. Converts up to four Audio/Video source inputs (DVD, PVR, VCR, Camcorders, video game systems, etc.) to VHF for viewing on any TV. 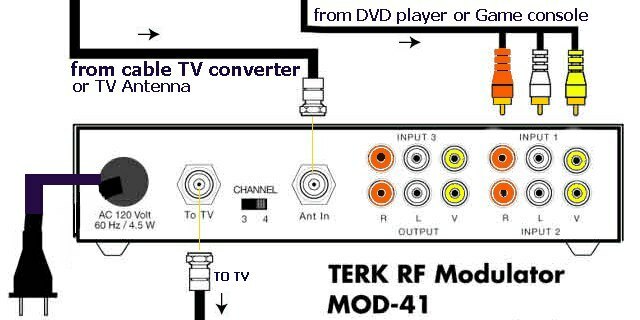 The Terk MOD41 RF Modulator converts up to four Audio or Video source inputs (DVD, PVR, VCR, Camcorders, video game systems, etc) to VHF for viewing on any Television. This Terk Modulator is switchable between video sources and cable antenna.